It was supposed to be a story centred on the usual suspects. Could Cristiano Ronaldo extend his remarkable run of scoring in the Clasico to seven games? Would Lionel Messi break Alfredo Di Stefano’s all-time mark of 18 strikes in the famous fixture? Instead, however, it was a tale of two tackles. 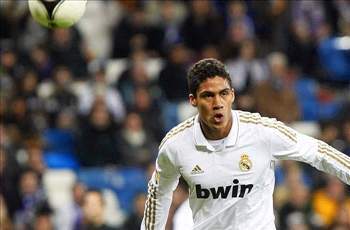 Raphael Varane rightfully took the plaudits in a peerless performance on Wednesday, his Clasico debut; the 19-year-old will be remembered for his 81st-minute header which levelled the scores at 1-1 and kept his side very much alive in this two-legged cup tie. But in the first half (with the scores still level), he had cleared the ball off the line and later produced an imperative intervention to prevent Cesc Fabregas from netting what would have been a decisive second goal, as Madrid trailed to the midfielder’s strike shortly after half-time. 56′ Fantastic challenge from Varane!! Fabregas is through on goal and bearing down on Diego Lopez, but the Madrid defender shows incredible pace and determination to sprint back and claw the ball back with a slide challenge. 65′ Brilliant challenge from Pique!! Ozil turns a superb cross to the back post from the right-hand side and Ronaldo, again, looks poised to smash home, but the Barca defender twists his body to pull the ball away from goal! Superb defending! Varane looked least likely of the two players to reach the ball but arrived first following a superb sprint and finished off the job with a perfectly timed tackle. And nine minutes later, with the game now an end-to-end encounter, Gerard Pique produced a tremendous tackle of his own to thwart former Manchester United team-mate Ronaldo as the Portuguese loomed in on goal. The Catalan defender slid in at the far post to poke the ball off Cristiano’s feet and preserve his side’s slender advantage – at least until Varane’s late leveller. It is often claimed that the art of defending is no longer a feature of the modern game, with rule changes and the use of synthetic footballs, plus slick surfaces, all aiding attacking players. This match, however, was an exception to that rule. Although an absorbing clash with plenty in the way of exciting attacks and positive possession play, Varane and Pique shone where Messi and Ronaldo were strangely subdued. The back fours cannot be said to have been on top throughout, but these two proved to be excellent exponents of their craft in testing times for defences and defenders everywhere. Pique, at his best, is up there with the very best defenders in the world, perhaps even at the top of the list. But on Wednesday’s evidence, he has a new rival in Varane, who also looks worthy of a starting spot at Madrid – even when Pepe and Sergio Ramos return to the side. Memorable moments in recent Clasico clashes include Messi’s dazzling dribble through the Madrid defence at the Bernabeu back in 2011, or Cristiano’s towering header to claim the Copa del Rey at Mestalla days earlier. Meanwhile, the art of saving goals and not just scoring them has been largely lost along the way. On Wednesday it returned and although attackers from both sides were guilty of missing clear chances in this match, the textbook tackles from Pique and Varane were worth the equivalent of a goal each to their teams. A talented teenager from France and a composed Catalan showed in Madrid that defending is definitely not dead. And thanks to those two, this tie remains very much alive.